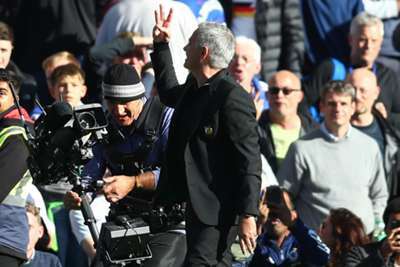 Chelsea head coach Maurizio Sarri has told the club's fans to show more respect to former boss Jose Mourinho following Saturday's heated Premier League clash at Stamford Bridge. Ross Barkley's 96th-minute equaliser salvaged a 2-2 draw for Chelsea against Manchester United – the dramatic last-gasp goal sparking a touchline bust-up. Chelsea assistant coach Marco Ianni celebrated Barkley's stoppage-time leveller in front of Mourinho and the United bench in London, much to the annoyance of the Red Devils boss, who had to be restrained by stewards. Discussing the fallout from the match, Sarri said: "Mourinho here has won and so I think that we need to respect him and to respect everybody who has won a trophy for the club." On the touchline incident with Mourinho and Ianni, Sarri added: "I didn't see anything on the pitch. "But after the match, I've spoken with Jose and Jose explained what's happened so immediately I understand that we were on the wrong way of this situation and so I've spoken with Jose, spoken with the young member of the staff [Ianni] and we have dealt immediately with the situation. "I've brought the member of staff to Jose to say sorry. I think it's finished but I want to be sure. We were wrong, we made a mistake."